The chic backdrop (and title) of the 1999 Julia Roberts and Hugh Grant blockbuster, Notting Hill is one of the most fashionable neighbourhoods in London. It is also home to a great deal of the capital's creative talent from artists and actors to fashion designers and writers. 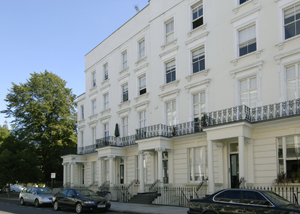 Located in the Royal Borough of Kensington and Chelsea, Notting Hill is especially popular with the rich and famous. With Hyde Park on the doorstep and many other beautiful open spaces on offer it is little wonder. W11 also boasts some of the most striking terraced houses in London not to mention its many clubs, pubs and restaurants. Each year the local area becomes a staging post for its very own world famous carnival. A thrilling fiesta of colour and creativity, this is the nearest you will get to Rio de Janeiro anywhere in Europe! Portobello Road with its quirky antiques and vintage fashion stalls is a hotspot. And if boutique hopping is more your thing, there is a vast array to choose from. One particular street has even been dubbed 'Rodeo Drive'. Notting Hill Gate tube station is served by the central, circle and district lines. There is also a strong network of buses travelling into the West End and City of London. If you are flying into Heathrow, take the Heathrow Express to Paddington Station, before changing for the District Line to Notting Hill Gate. From Gatwick, take the Gatwick Express to Victoria Station and then take the Underground to Notting Hill Gate.